Active areas can be used to extend the event functionality and to add visual hints to the event. You can define the dimension and position relative to the event box. Customize the active areas using custom HTML and styles. You can also set the horizontal position using date/time values - use Start()/End() methods on the server side or start/end properties on the client side. 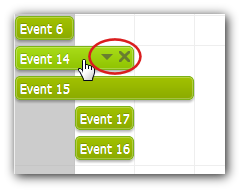 By default, active areas are only visible on event hover. It is possible to make them permanently visible. You can define active areas using BeforeEventRender event handler. The example styles ("event_action_delete" and "event_action_menu") are defined in Themes/areas.css stylesheet.